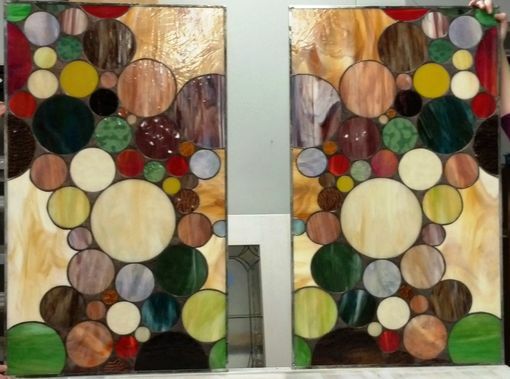 These 2 stained glass windows, made with a bubbles design in earth tones, are mirror images of each other. Finished size including zinc outer framing is 21 2/18 wide X 35 7/8 tall. These windows were built using a large variety of earth tones with pops of red. We also added special glass from our collection in order to add interest. 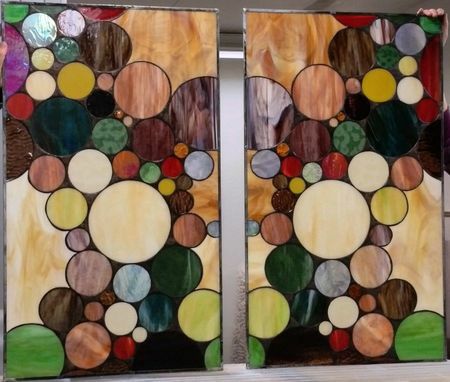 These pieces were based on the original "Transom with 3D house numbers Earth Tone (AM-16)" but with use translucent opal colors on the background for privacy.